The year was 1912. For the first time, the University of Virginia was allowing women to take classes. One young woman was looking for her path as she attempted to cope with her parents separating. Almost on the brink of giving up her dream of being an artist, the lessons she learned in the philosophy and empowerment of art led her to continue, and the world is better off for it. This young woman was Georgia O’Keeffe. Georgia O’Keeffe was the second of seven children. At the young age of ten, she decided that she wanted to be an artist. Through her family’s moves from Wisconsin to Virginia, she continued to pursue her dream. In 1908, while studying at the Arts Student League, her still life Dead Rabbit with Copper Pot, won the League’s William Merritt Chase still-life prize. By the end of 1908, O’Keeffe was abandoning the idea of pursuing an artistic career, feeling that the confines of traditional art instruction would not allow her to distinguish her art from others. Georgia O’Keeffe was just 25 years old when she enrolled in a summer course at the University of Virginia in 1912. While there her love of art was renewed as she studied the philosophies of American artist, Arthur Wesley Dow. Dow’s philosophies on art were that it should not be a direct copy of nature, but one’s personal realization and expression of nature. This ideology conflicted with the teaching methods of the time and renewed O’Keeffe’s zeal for art. This philosophy became a cornerstone of the American Modernism movement as did the works of O’Keeffe herself. O’Keeffe had made such a name for herself in the movement that by the mid 1920s she was known as one of the most important American artists with her art fetching high prices, not only unusual for a living artist but moreover a female artist. 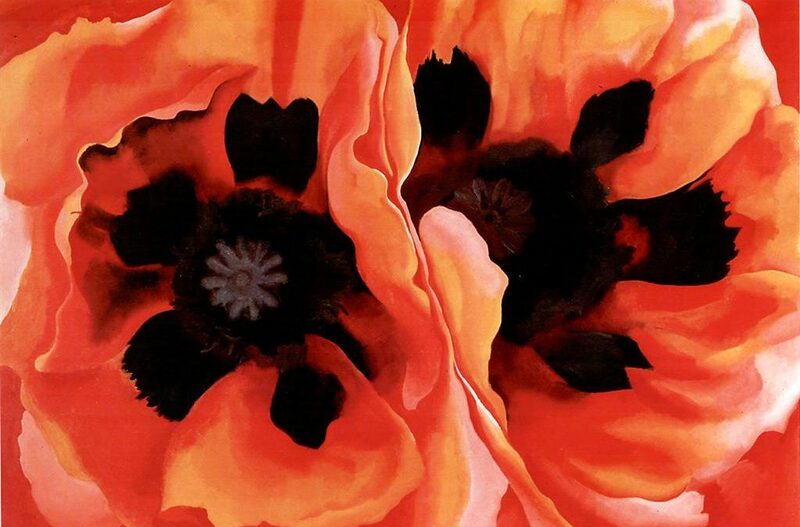 Georgia O’Keefe is most notably known for her flower paintings, but her subjects were vast and varied beyond the botanical. Though macular degeneration robbed her of her central vision in the 1970s, she continued charcoal and pencil paintings and even learned sculpture late in life from her confidant and ranch hand, Juan Hamilton. Georgia O’Keeffe passed away in 1986 at the age of 98. Her impact on American Modernism is still felt to this day. Now through the end of the month, see the Pulling Threads gallery exhibit at Root Division. The exhibit “showcases the lasting influence of the Feminist movement on the next generation of female artists.” Don’t miss out on the fascinating look at art and modern feminism. For more details, visit: http://bit.ly/pulling-threads-rootdivision. Have you always dreamed of a Victorian London Holiday fair? The Cow Palace will transform into a one-of-a-kind holiday landscape with hundreds of performers in character strolling through the recreated streets of London. Shops, music and dancing will bring you back in time. For more information, visit: http://bit.ly/great-dickens-holiday-fair. The Bay Area doesn’t see that much snow, but that doesn’t mean we have to miss our on a White Christmas! Head over the bridge to the free admission 37th Annual Winter Wonderland with sled rides and parades to get you in the Holiday spirit! To learn more, visit http://bit.ly/37th-annual-winter-wonderland-san-rafael. Art Attack is an art studio in Burlingame that provides instruction in the fine arts to children, teens and adults. Art Attack offers affordable Bay Area art classes painting classes year round to the residents of the San Francisco Bay Area. We offer Bay Area kids art classes for ages 5 and up with after school and weekend classes, as well as teen and adult art classes Monday through Saturday.Looking for a place to have a fun and unique party? Art Attack Burlingame also has Arty Parties which are perfect for any occasion: birthdays, showers, girl’s night out and even office team building!